We're eagerly awaiting the Brewers of Indiana Guild's 19th Annual Microbrewer's Festival, which is a little less than a month away. In fact, we're so eager to attend the festival that we want to get into the spirit as soon as we can. To that end, we've put together a series of beer events during festival week. 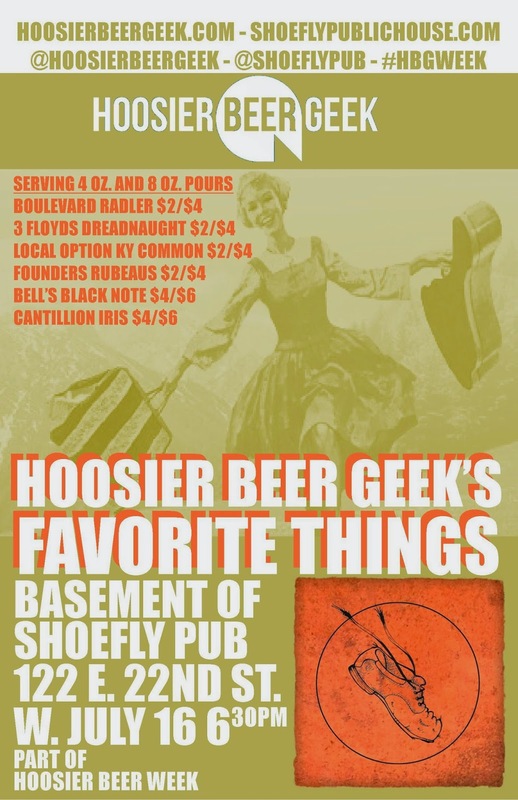 We're calling that series of events Hoosier Beer Geek's Hoosier Beer Week. Spread the word, and use the hashtag #HBGWeek on Twitter and Facebook. Tuesday, July 15, Mass Ave Pub, 6pm | Girls Pint Out's Second Annual Beer Cocktail Contest. We support the ladies from Girls Pint Out wholeheartedly, so we're leaving this date open on our calendar to attend GPO's Second Annual Beer Cocktail Contest. 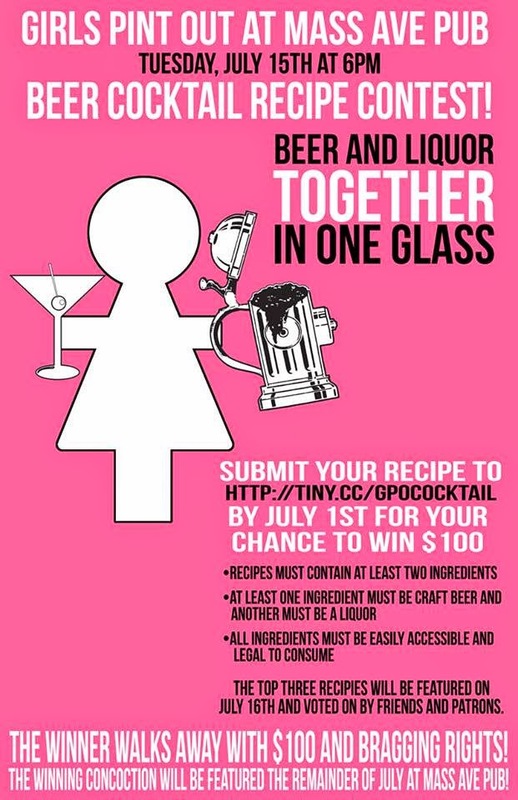 Come check out the three best cocktail recipes to see who claims the $100 prize! Wednesday, July 16, Shoefly Public House, 6:30pm | HBG's Favorite Things. Join us at Fall Creek Place's innovative gastropub as we feature some of our favorite beers. Beer lineup includes beers from Brasserie Cantillon, Local Option, and Three Floyds. Full event details here. 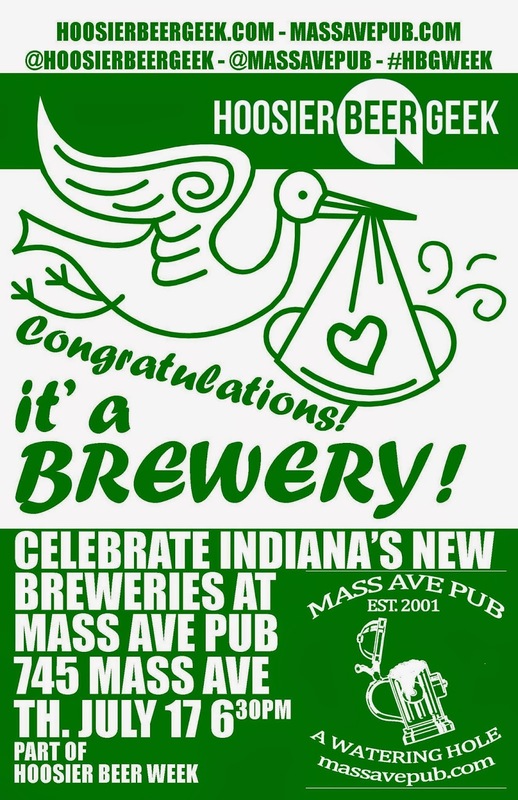 Thursday, July 17, Mass Ave Pub, 6:30pm | New Indiana Breweries Night. We celebrate newcomers to Indiana brewing. The beer lineup includes beers from 18th Street, Outliers, Scarlet Lane, and Taxman. Special guest appearance by the king of bourbon-barrel-aged beers, Goose Island Bourbon County Brand Stout. Full event details here. 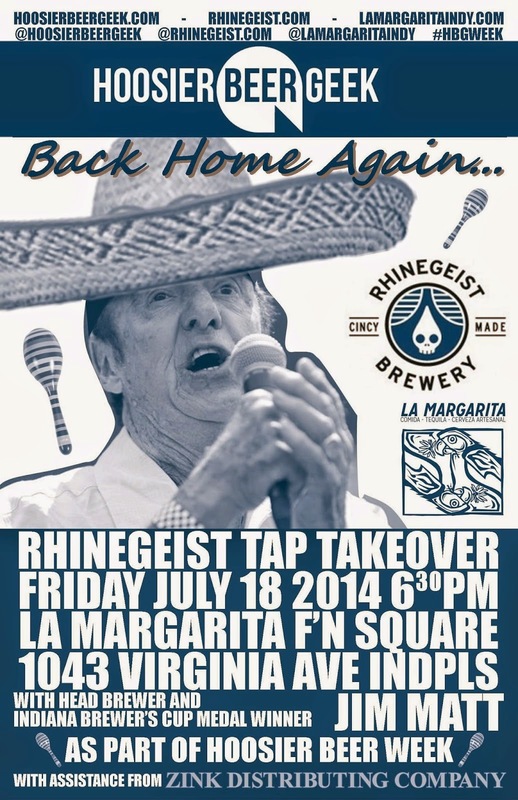 Friday, July 18, La Margarita, 6:30pm | Back Home Again in Indiana Night with Rhinegeist Brewery. We feature a tap takeover by Cincinnati's Rhinegeist Brewery. Rhinegeist's head brewer is Jim Matt, who was formerly the Quality Manager at Sun King Brewing Company. Jim will be on hand to chat about Rhinegeist's beers, including the acclaimed Truth IPA. Full event details here. Saturday, July 19, 3pm - 7pm (2pm Early Bird Admission) | Indiana Microbrewers Festival, Optimist Park & Indianapolis Art Center grounds. Tickets available here. Sunday, July 20, Thunderbird, Time TBD | Hangover Brunch. Recover from the festival with a hearty brunch at Fountain Square's Thunderbird. Full event details here.